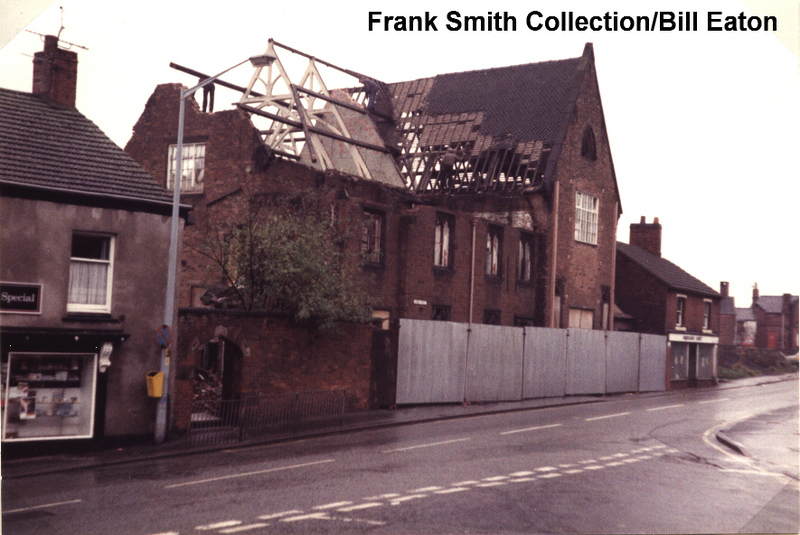 The last of the large buildings in Lewin Street to disappear in the 1980s was the much-photographed CofE Infants School, and once it had gone the whole aspect of the street altered. Like so many other buildings on the street, the school suffered from the instability of the ground it was built on and, in its latter years, itself became unsafe, as can be seen from the strengthening girders bolted onto the outer walls (the pinkish-coloured vertical lines on either side of the large windows to the right of the building). 'Frank's notes for these photographs say more about the craftmanship you can see in this old school than the demolition itself. Notice, on the left, Les Gibbins' newsagents shop, which, as we saw here, still exists, though not as a shop. Next to this is the pleasing little arched side entrance to the school which, fittingly for a church school has a vaguely ecclesiastical look to it. At the other end of the building is Square One, which was, in the early 1960s,a record shop. Although large metal sheeting has been erected alongside Lewin Street to protect people and traffic from any fall-out from the demolition, there are no 'Demolition In Progress' signs. Presumably the contractors thought people might be able to work this out for themselves. Frank's other shot, of the rear of the building, was taken from the Kinderton side of the Trent & Mersey Canal and River Croco, most likely from the bottom of Seabank and, again, the beautiful internal roof structures can be seen to good advantage. 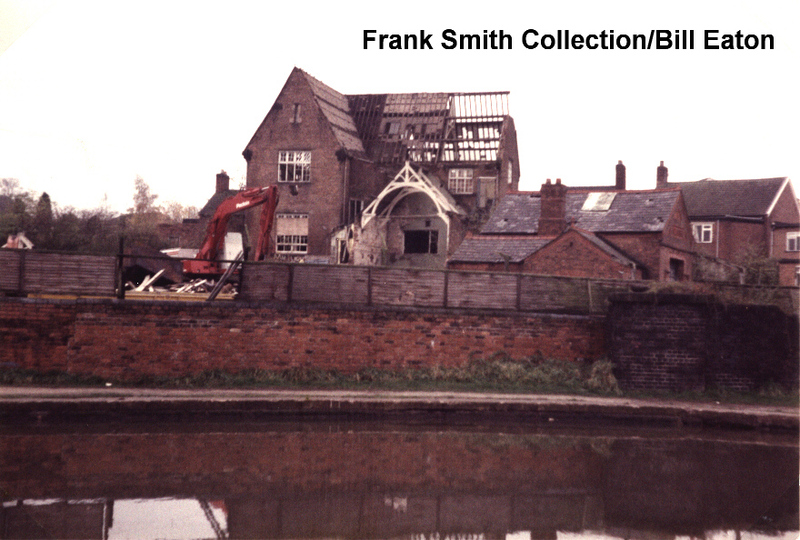 To the right of the school is the old fire station and to the right of that, at towpath level, is the blue brick structure which was once part of the footbridge which linked Seabank and the Town Wharf.